Echo Arena is a fast-paced, zero-gravity disc-throwing multiplayer VR game. Two teams, up 4-player each, need to score goals in a stunning virtual sport arena full of obstacles. You can also use your first and use a swift punch to stun your opponent or capture a ride on another player's back by grabbing his back. 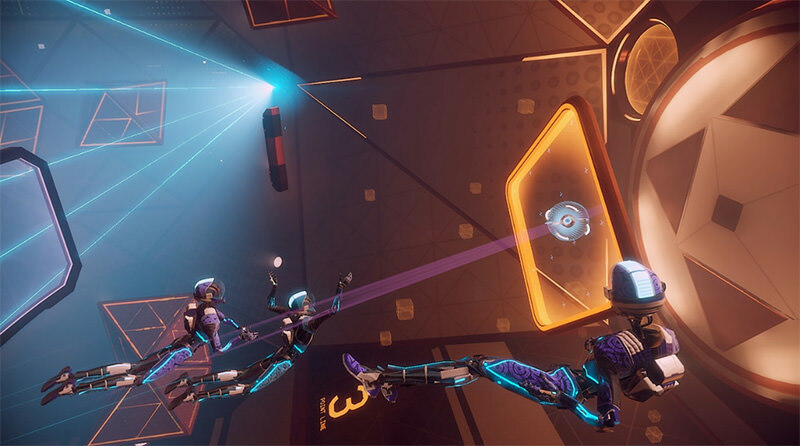 With innovative gameplay mechanics and strategics gameplay and social aspects, Echo Arena put itself as one of the most compelling competitive MP games for Oculus Touch. Echo Arena is a spin-off of the single-player story-based VR title Lone Echo. 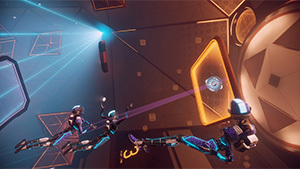 One game is a sci-fi zero-gravity adventure game, and the second, Echo Arena, was designed from the ground up as a zero-gravity competitive multiplayer game with eSport in mind. The game is an Oculus Touch exclusive title. The game requires an Oculus Touch to play and its gameplay mechanics and special expression are designed to take full advantage of the Oculus Touch controllers. I just love multiplayer VR games and this is where I spend most of my time in. I really think that we need more great multiplayer VR games, especially competitive e-Sport oriented ones like this one. I think that Ready At Dawn just went all-in with Lone Echo and Echo Arena, and you can definitely see this when you look at the visuals, the arena design, in-game social interaction, and the innovative gameplay mechanics. In the game, two teams of up to 4-players are pitched against each other in a 6DoF zero-gravity arena. You play as a robotic Iron Man -like character. Your team needs to use score a goal using a flying disc which can be thrown like a Frisbee. Echo Arena features lots of dynamic and interaction with both the environments and the others players. You can grab objects and throw yourself in a designated direction, you can use your thrusters in your hands to move in any direction and you can hide behind obstacles. Echo Arena is also what the developer called "full-contact sport", which means that you can use your fist to hit other opponent and even land a hard strike on his head and stun him. I've also seen some gameplay where you can even grab his leg and put him towards you and then hit him in the face—so cool, isn't it?. You can also ride on another player's back, which can be used to produce some smart surprising tactical moves. Players need to pass the disc from one player to the other, like in a basketball or football game. The obstacles in the arena can be a distraction, but they can also be used to deflect the disc towards a specific location, allowing you to confuse the opponent and pass the ball in a way that it won't be intercepted by the opponent's team. Echo Arena went into an open beta on June 23rd through June 25th. Unlike Lone Echo which is a paid game, Echo Arena will be released for free, sponsored by Intel when it launched on July 20th, 2017 (I've heard that in an Interview with Doug Fisher, Intel's software guy in a PC Gaming Show 2017 video by PC Gamer on YouTube). Oh, speaking of which, did you know that Ready At Dawn was formed by former members of Naughty Dog and Blizzard Entertainment? Of course Ready At Dawn has all the right reasons to do so. To make this an e-Sport game very popular, especially in VR which its audience is more limited, you need to give the game for free to allow as many people to get into it. The developer wants to have as many players as possible when the game launches and of course, there will be sponsored e-Sports tournaments that will help to kick this game off when it launches. Blizzard did it very successfully with its multiplayer FPS title Overwatch, I have no doubt that this can works for this VR title as well. There is also an Echo Arena big ESL Intel Extreme Masters finals event taking place in Poland in 2018. Of course, it's a bit weird seeing people playing with headsets on, but the focus is on the game itself of course, what happens inside that competitive virtual arena. The developer has given a lot of attention to make sure that people who watch these competitions get a comfortable viewing experience by utilizing smart first-person third-person view of the action. Competitive e-Sport Multiplayer VR is just making its first move. Developers are still debating what is the best way to use this medium to make a great eSport virtual reality game that it both fun, comfortable to play and of course great to watch. Lone Echo is definitely an intriguing take towards bringing VR strong into the e-Sport scene. and this presence and accurate physical-to-virtual replication add to the immersion, making the game more fun to play. The question that I'm sure that VR players will want to know is whether this game can cause motion sickness? I've heard that some players who played it in events got motion sickness, some had no problems. Polygon's editor Charlie Hall also report that the gameplay was "surprisingle very comfortable". I also hope that the visual cues on the arena will help players not get vertigo. Ru Weerasuriya, Ready At Dawn co-founder, CCO, and President, told Geoff Keighley at E3 2017 that they saw people getting comfortable and not getting discomfort playing this game. Some played even for many hours without any discomfort. That yet to be seen, but I'm quite positive that Ready at Dawn did the best to make sure the game is as comfortable as possible. This is very important for any VR game, especially for an e-Sport game that wants to appeal to a very wide audience. I think it's great seeing a company like Ready at Dawn choosing to focus on VR. They could have gone with a non-VR competitive e-Sport game. I think it's a smart move because the none eSport scene is very crowded, and here they have an option to be among the pioneers and start up something completely new and unique that will help to push the VR eSport industry forward. Graphics wise, Echo Arena looks amazing. We all know that Ready at Dawn can make stunning looking games and they give a lot of attention to the visuals, so Echo Arena is no exception. The arena has a futuristic look with a few color tones, making sure that players can focus on strategy and not be distracted by many colors and unnecessary objects in the scene. It also makes the game more comfortable to watch for viewers. I talked a lot about the eSport aspect of this game, but of course, it will be really amazing to just play against other players online and play in competitive mode to climb up the ranks. This is a superb social multiplayer game that is amazing to play with friends like Overwatch is. Voice interaction is a crucial aspect of this game. When you play you'll hear your teammates talking to each other and creating strategies in real time. This is what I love about Blizzard's Overwatch, and I have a good feeling that it will be like that in Echo Arena as well. There will be a matchmaking system and a social lobby where you can meet other players and practice with them. All in all, Ready at Dawn has something really special here. A superb competitive multiplayer game that has a potential to kickstart the VR eSport. Also giving us, VR players (Oculus Touch owners to be more specific), the opportunity to enjoy a really great competitive multiplayer VR experience. Let us just hope that Echo Arena indeed gets to that place visioned by the developer. If you have the Oculus Rift with Oculus Touch, you'll definitely have to check out this game. 2017 © vrgamesfor.com. 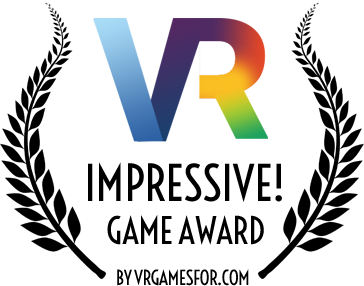 VR Games For Google Cardboard, HTC Vive, Microsoft HoloLens, Oculus Rift, PlayStation VR, Samsung Gear VR.. List of the best and latest virtual reality games for VR headsets. Searching for new VR games to buy for your console or PC? VR Games For is the best place to get started. We have: VR game news, facts. announcements, reviews, opinions, videos, release dates and much more. VR Games For website is being updated on a daily basis. All other trademarks, trade names, logos, or company names referenced herein are used for identification only and are the property of their respective owners. We are doing our best to keep each VR game information accurate as possible. If you find a mistake or missing info, please contact us at admin[at]vrgamesfor.com. Some of the gameplay videos might be from alpha or beta development phases. Some of the games' announcement and release dates might be different from what appears on the site. We are doing the best we can to make the data up-to-date and accurate as possible. Disclosure: vrgamesfor.com website is a participant in the Amazon Services LLC Associates Program, an affiliate advertising program designed to provide a means for sites to earn advertising fees by advertising and linking to amazon.com.